Dr. Steve Tuggle has been writing dental, health, fitness and wellness articles since 2007. He has been published in the “Journal of Endodontics” and is the author of “The Relaxed Root Canal” ebook. He completed his dental degree and endodontic residency at the Medical College of Georgia School of Dentistry. Inflammation of the dental pulp can cause a mild, moderate or severe toothache. This small soft tissue structure found inside a tooth contains blood vessels, nerves and connective tissue and functions to create the tooth’s hard structure during development, according to the American Association of Endodontists. It has no function in a completely developed tooth, but it is possible to experience a toothache from pulpitis, or pulp inflammation. Pulpitis comes in two forms. The first is reversible pulpitis, caused by a mild inflammatory response that resolves before causing an infection. The second is irreversible pulpitis, which is more severe and will eventually lead to necrosis of the pulp and a tooth abscess. The bacteria found in tooth decay cause inflammation of the pulp. A small cavity causes reversible pulpitis and sensitivity to hot, cold and sweets. An exposed root surface caused by gum recession may also result in this pulpitis. Extensive decay that approaches or reaches the dental pulp causes irreversible inflammation according to the American Academy of Family Physicians. Repeated dental procedures, cracks and trauma can also cause pulpitis, according to the American Association of Endodontists. A rapidly diminishing sensitivity to heat, cold and sweets characterizes reversible pulpitis. A prolonged sensitivity to the same stimuli indicates the presence of irreversible pulpitis. Spontaneous pain and pain on biting may also be present with this condition. A toothache relieved by keeping ice water on it is a classic sign of a toothache from pulpitis that is irreversible, according to the American Association of Endodontists. Removing the decay and placing a filling is the treatment for reversible pulpitis. Placing a filling over an exposed root surface or treating the area with a desensitizing solution is also an effective treatment. The symptoms abate in a matter of days as the inflammation abates. A pulp with irreversible pulpitis will never return to its healthy state. 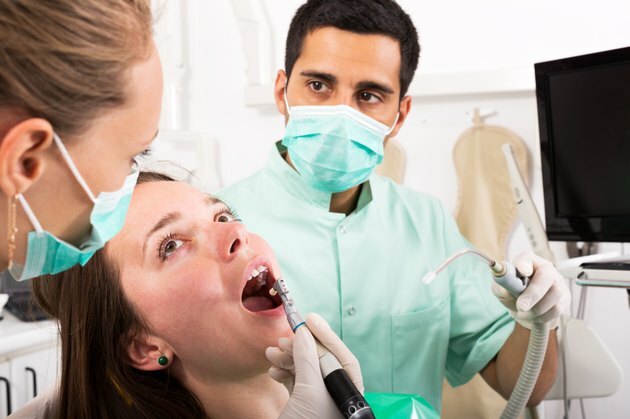 Root canal therapy is necessary to save a tooth with irreversible pulpitis. According to the Cleveland Clinic, extracting the tooth is the only alternative to this treatment. According to the American Academy of Family Physicians, a complication of pulpitis is the formation of an infection, or dental abscess. This may result in an infection spreading to the jaw or other surrounding areas. Prompt dental treatment at the onset of pulpitis symptoms can avert an infection from developing in some cases. Is There a Home Remedy for Teeth Tingling?